Ann Wilson will conduct a live Q&A for fans This Saturday Jan 25 from 2-3pm PST/5-6pm EST. Use hashtag #AskAnnWilson to submit your question. Breaking news! Ann Wilson confirmed to sing at the NFC Championship Game in Seattle on Sunday January 19. Concert for the Philippines, presented by Music For Relief and featuring LINKIN PARK, The Offspring and Bad Religion, is proud to announce the addition of special guests Ann and Nancy Wilson from Heart, Travis Barker and The Filharmonic. AXS TV has one more present for its audience to unwrap on Christmas night when the Network broadcasts the first-ever holiday concert by GRAMMY� Award-winning and Rock and Roll Hall of Fame Inductee HEART. Beginning November 27: You can win a signed autographed guitar by bidding on an auction from Guitars Not Guns, an organization that provides guitars and lessons to foster children, at-risk youth and other deserving children. Two new Christmas songs by Heart! Ann and Nancy Wilson decided to usher in the holidays by reaching out to vocalists they sincerely admired (and had always wanted to work with). Sir Elton John will welcome the legendary band Heart as his special musical guests for the 12th annual An Enduring Vision gala to benefit the Elton John AIDS Foundation. The event will take place on Tuesday, October 15, 2013, at Cipriani Wall Street in New York City. Heart�s 2013 �Heartbreaker Tour� has been deemed �Storm Ready� and was presented with official documentation by the National Weather Service and WDT officials Thursday, August 15th prior to a show in Dallas, TX. From the smash early success of 1975�s Dreamboat Annie to contemporary hits launched by her much-applauded return to the band in more recent years, Heart guitarist Nancy Wilson has been the cornerstone of many of rock�s most enduring songs, and the architect of a myriad timeless riffs. Beat "The Heat" with our store wide special all of July! For this month, we've got our own heat going on in the store! Fans can currently bid on an auction to benefit The Busted Foundation, a breast cancer charity organization in Los Angeles. Ann and Nancy spent Ann Wilson's birthday at the CNN Headquarters on Wednesday for a new interview on CNN Called New Day Weekend. June Special in the Heart Store! New special for June! 2 for 1 specialized license plates from HEART! 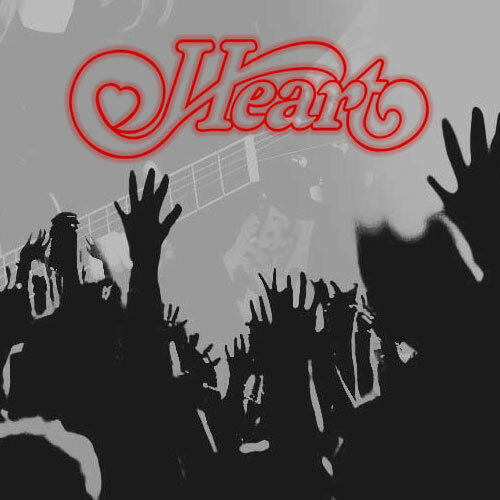 Heart has announced a new show at the Town Toyota Center in Wenatchee WA on October 12, 2013. Presale starts May 21 and ends May 22.